Ronaldo and Portugal were dumped out of the World Cup at the group stages. ALONG WITH LIONEL Messi, Cristiano Ronaldo has been indisputably the best player in the world over the last few seasons. At 29, now is around the time where he should be at his peak as a footballer. Overall, there is no doubt that he has had a fantastic season. As usual, he scored goals for fun (31 in 30 La Liga appearances alone) and deservedly won the Ballon d’Or earlier this year, after almost single-handedly guiding Portugal to the World Cup as he scored a phenomenal hat-trick in their play-off win over Sweden. Despite struggling in qualification at times, the Portuguese were seen as a decent outside bet to win the tournament. In addition to Ronaldo, they boasted a squad with other highly-rated stars including Joao Moutinho and Fabio Coentrao. Nonetheless, the team’s preparations were overshadowed by fitness concerns surrounding their main man. By his standards, Ronaldo had a poor enough Champions League final, scoring late on when the game was all but over, yet rarely influencing the play at the vital moments. Prior to the tournament in Brazil, the Real Madrid attacker acknowledged he had yet to leave a definitive mark on a World Cup — indeed, before 2014, he had scored just twice in the competition. He expressed hope that by starring this year, he would further consolidate his place among the greats of the game such as Pele and Diego Maradona, the majority of whom have enjoyed at least one spectacular showing at the World Cup. Portugal were comprehensively beaten 4-0 in their opening match with Germany and Ronaldo, possibly because he wasn’t fully fit, performed disappointingly. It’s long been known that he is less than eager to track back, and as the star is so potent in attack, he is consistently deemed a luxury player worth accommodating. Nevertheless, teams can, on the other hand, sometimes suffer defensively with him in the side. Of course, clubs often park the bus against Real Madrid, who also happen to have far superior players compared with Portugal, so the star’s defensive deficiencies are seldom too costly for his team at club level. Yet the Portuguese are more likely to suffer with the former United man, especially when teams set out to attack them, and this was the case on more than one occasion during the squad’s brief stay at the 2014 World Cup. Granted, Ronaldo was hardly the primary culprit, as the Germans breezed past his side. That criticism would surely be aimed at his Real Madrid teammate Pepe, who was correctly sent off for a petulant off-the-ball incident also involving Thomas Müller. With Joachim Löw’s side already leading 2-0, the game all but ended as a contest there and then. That said, Ronaldo was far from blameless as Portugal were beaten easily. Continually, Jerome Boateng and Sami Khedira had Portugal overrun down the right flank. And consequently, both the penalty that led to the opener, as well as the fourth goal, came from attacks down the winger’s side of the field, as Paulo Bento’s team were made to pay for their lacklustre, error-prone defending. That said, Ronaldo was not performing especially differently to the manner he regularly does at club and international level. What is perhaps surprising is that Portugal are continually willing to play with a striker in addition to Ronaldo, as well as three central-midfield players and Nani, who is in fact far more of a positionally disciplined winger than Ronaldo, in spite of all his other faults, and presumably because he is given less license to wander. The result of Ronaldo’s ill-discipline is that there is almost always plenty of space for the opposition to expose, and unsurprisingly, being a top-class side, Germany duly made the most of this opportunity. Nonetheless, what was different to Ronaldo’s usual performances for Real Madrid was that, in the final third, he was nowhere near as lethal as is customarily the case. This is partially because he is playing with inferior players, but even allowing for that, he was uncharacteristically sloppy with his finishing and final balls against Germany and, to a slightly lesser extent, in the other two games as well. Such flaws are bound to raise renewed question marks over whether he was ever fully fit to begin with, as the fallout from Portugal’s failure intensifies. Furthermore, it also arguably renders the ex-Manchester United star somewhat of a liability for his country — when he is not regularly scoring goals and not tracking back, people begin to justifiably ask what he actually does offer. And to add further insult upon the country’s long-suffering fans, the argument for having half-fit great players in your team — simply because their mere presence supposedly elevates the entire XI on a psychological level — was seemingly not applicable in this instance either. In fact, on the contrary at times — for instance, during separate counter-attacks against Germany, both Nani and Fabio Coentrao looked to pick out Ronaldo when they would have been better off going for goal themselves. It is almost as if Portugal stars are adversely affected by an inferiority complex when Ronaldo competes alongside these players, essentially causing them to underperform rather than deriving inspiration to raise their game with the 29-year-old in the team. Hero or villain versus USA? It’s somewhat ironic that Ronaldo will be remembered as the player largely responsible for rescuing Portugal against the USA. The star’s inch-perfect last-minute cross to set up Silvestre Varela’s dramatic equaliser gave viewers a brief glimpse of his genius, just as his main rival Lionel Messi had a quiet game against Iran before hitting an extraordinary winner. Furthermore, his memorable illustration of elaborate ball control after four minutes was similarly impressive (see below). But when measured over the 90 minutes, this was another less-than-vintage performance from Ronaldo. He started out on the left, but struggled to get himself involved in the action. Frustrated, and presumably with the blessing of the coaching staff, he positioned himself increasingly in the centre of the pitch as the game developed. And while Ronaldo’s influence on proceedings remained relatively peripheral until his last-gasp intervention, the same could not be said of USA’s right-back Fabian Johnson. Johnson is a fine athlete who showed considerable stamina to burst forward at every available opportunity, while rarely neglecting his defensive work. First, Andre Almeida and then Miguel Veloso were stationed at left-back in place of the injured first-choice star Fabio Coentrao, but neither looked comfortable in the role, particularly with the lack of cover being offered by Ronaldo. Sometimes, Raul Meireles would attempt to fill in for his absent colleague, yet presumably exhausted from also attempting to manage his central-midfield duties, he was usually ineffectual in stopping the relentless US attacking down that side and by the end, appeared to be making only token efforts to alleviate the threat. Somewhat fortunately for Portugal and Ronaldo though, the US weren’t particularly efficient at exposing their structural weaknesses in the first half. Often, Johnson’s gut-busting runs forward were ignored, as players such as Michael Bradley and Jermaine Jones instead either ill-advisedly attempted pot shots from distance or tried to thread intricate passes through to lone frontman Clint Dempsey, despite the acres of space that the energetic full-back was regularly being afforded. Moreover, on the rare instances when they did try to find him, the results were mixed at best. Bradley’s sporadic attempts to play his teammate through were intercepted by a Portuguese defender, and on the rare occasions that the 26-year-old star did get behind the defence with the ball, his final delivery was invariably poor. Nonetheless, at half-time, the US players were surely instructed to capitalise on Ronaldo’s near-perpetual absence down the right flank, given their patently increased focus on this area of the pitch. Both the Real Madrid star and striker Eder were playing as glorified goal hangers. The former, as we know, tends to be quite lazy and usually neglects his defensive duties, especially when the game isn’t going his way, while the latter is unavoidably clumsy and immobile. Therefore, it’s no surprise that it often seemed as if the US had an extra man for much of the second half and some of the first, as Portugal were carrying two passengers from a defensive viewpoint. Despite the switch in full-back, the Portuguese management remarkably never really effectively addressed the continuing problems they faced down the right, meaning they were increasingly overrun whenever Jurgen Klinsmann’s team got bodies forward. On the other hand, USA were sometimes under threat too owing to Portugal’s large numbers available for counter-attacks, so there was an element of Russian roulette to both sides’ play. It was thus no surprise that the two American goals both emanated from their right flank. The corner from which Jones scored a stunning equaliser was won after an attack down the right that had been rather desperately cleared out of play. The second was a cross from DeAndre Yedlin — another pacy player brought on to do further damage down Portugal’s left — which eventually resulted in Dempsey calmly chesting the ball into the net. The USA’s naive defending and tendency to sit too deep in the dying minutes, along with Ronaldo’s rare moment of unequivocal brilliance, ultimately denied them a victory — yet the Portuguese celebrations at full-time were muted — they knew they still required a near-miracle to qualify. Against Ghana, Portugal tended to suffer less as a result of Ronaldo’s reluctance to defend. Paulo Bento’s side were more dominant than in either of their previous two games, largely because they were playing the weakest side in the group. Yet again however, it was a bittersweet afternoon for Ronaldo. Incredibly, before this match, he had just two World Cup goals in total to his name in spite of having attempted 62 shots overall during the course of the tournaments in which he’s competed. Ronaldo managed to score a third-ever World Cup goal against the Ghanaians, yet Portugal’s winner was largely down to the opposition goalkeeper Fatau Dauda’s incompetence as opposed to the star’s genius (see video above). Moreover, the Real Madrid player failed to take advantage of more than one gilt-edged opportunity during the game — missing the type of chances he would normally dispatch at will. This was particularly crucial, as Portugal desperately needed to boost their goal difference significantly to have any hope of qualifying. Conclusion: Success, failure or somewhere in between? On the face of it, Ronaldo’s performance at this World Cup was far from disastrous. Many of Portugal’s serial deficiencies — Pepe’s penchant for acts of stupidity, for instance — were beyond his control, and they were simply outclassed by a German side who are unquestionably better when measured player for player. 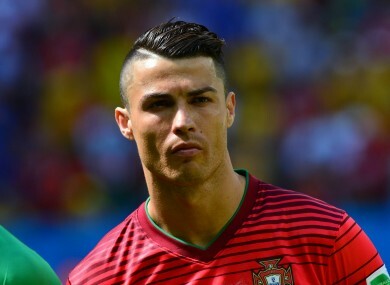 In addition, Ronaldo unquestionably made an impact against the so-called smaller nations, hitting the winner against Ghana and providing the assist to earn his side a point against the USA, so it would be unfair to suggest his class was entirely absent over the course of his brief involvement in the competition. However, when you consider his heroic performance in helping them to qualify against Sweden, this version of Ronaldo was a pale shadow of the one seen in the play-offs last November, while his defensive weaknesses were more pronounced as a result of his continual lack of sharpness in attack. Perhaps some of the blame lies with the management for not using Ronaldo adequately, allowing sides to expose Portugal by playing him in the wide areas without giving the full-back sufficient cover. And of course, no matter how much Ronaldo and other members of the Portuguese set-up deny it, his fitness was undeniably an issue to some degree. His body language, especially in the Germany game, was poor. He refrained from playing with his normal swagger for much of the tournament, and as mentioned already, his finishing lacked its customary clinical touch. Messi may yet emulate Maradona and achieve the highest honour on the international stage, but Ronaldo seems destined to be remembered as a player who, for a variety of reasons, never consistently illustrated his greatness at the World Cup. He will be 33 by the time Russia 2018 rolls around and so, will surely now have to be content with a brilliant club career. Email “Analysis: Has Ronaldo been an asset or a liability for Portugal at this World Cup?”. Feedback on “Analysis: Has Ronaldo been an asset or a liability for Portugal at this World Cup?”.